How to draw Arya Stark from Game of Thrones. Learn to draw Arya Stark in semi-realistic illustration style from step by step with instruction. 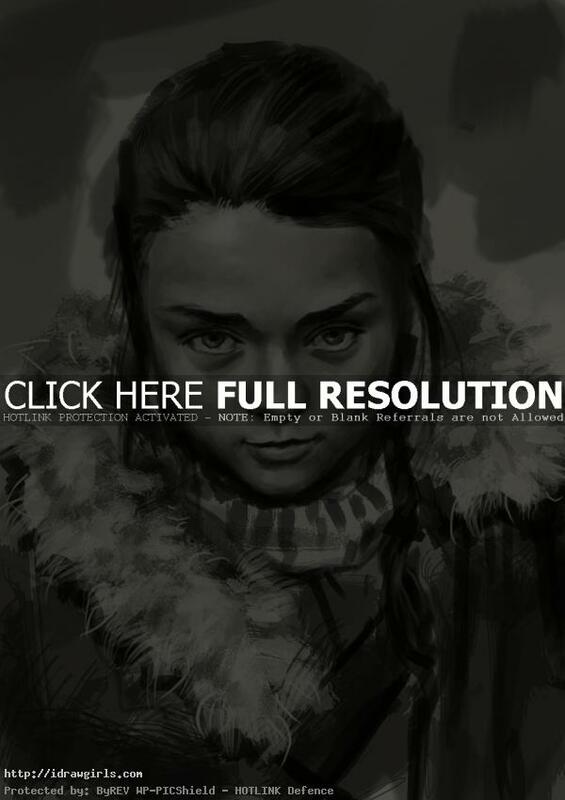 In this tutorial, you will learn to draw Arya Stark or as portrayed by actress Maisie Williams in the illustrated comics style. You will learn to draw facial structure or portrait, hair and fur coat of a Arya Stark from a HBO series Game of Thrones and up coming season 2, Clash of Kings. Arya is one favorite characters from book. In this drawing, I use custom Photoshop brushes I made to mimic the look of charcoal drawing. A Game of Thrones is the first book in A Song of Ice and Fire, a series of epic fantasy novels by American author George R. R. Martin. Arya Stark is the youngest daughter of Eddard and Catelyn, and the sister of Robb, Sansa, Bran and Rickon and half-sister of Jon Snow. Arya rejects the notion that she must become a lady and marry for influence and power, feeling she can forge her own destiny. She wields a sword named Needle. She is skinny, athletic and has strong Stark family features, with a long face, grey eyes and brown hair. At the start of the story, she is generally regarded as plain, as exemplified by her nickname “Arya Horseface,” and often mistaken for a boy. She wants to learn how to fight with a sword and ride in tourneys, to the horror of Sansa, but she is encouraged by her half-brother Jon Snow, who is particularly close to her. Throughout her travels, Arya displays great resourcefulness, cunning, and an unflinching ability to accept hard necessity. She is said to take after her fiery aunt Lyanna in temperament. However, there are instances of her being called pretty, compared to the beautiful Lyanna, and catching the eye of men later in the books. Here is a final drawing of Arya Stark from Game of Thrones. 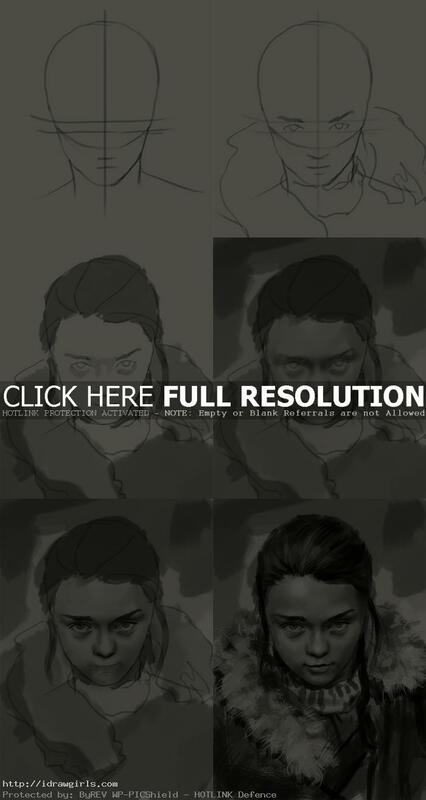 Below are step by step how to draw Arya Stark from Game of Thrones. Step one, I start with an egg shape drawing, this portrait will be in front view of a face. Imagine a flat plane on front surface of an oval shape, then draw two vertical lines across the imaginary plane. After that, draw a vertical line to divide the flat plane in half from top to bottom. Then draw a horizontal line to separate the top and bottom distance in half. This horizontal line would be where humans eyes should be, they are usually right in the middle of the face horizontally. Step two, I drew her eyes on the level of horizontal lines, nose half way from eyes level to the bottom of his chin, lips half way from the tip of his nose to his chin. Then I added some hair. Step three, I fill his face and body with half tone value then begin to add detail to his eyes then eyebrows, and nose. Step four, I add more gray shading to make her facial feature form out of flat surface.